How Can We Get Our Students Ready for the Future? There are a million answers to the question but the time and space remain the same. It's in the classroom, its in schools all over the world. Start with the place. The learning environment. What Is Future Focused Learning? The term 'Future Focused Learning' and 'Future Focused Learning Environments' are recognised by the NSW Department of Education as foundational learning and teaching practice that not only encourages students to use their 21st-century skills, it urges them to master them. This is because learning how to think critically, communicate, collaborate, connect with one another and be creative in solving complex problems is essential in transforming students into global citizens who will thrive in our rapidly changing, technology-driven world. 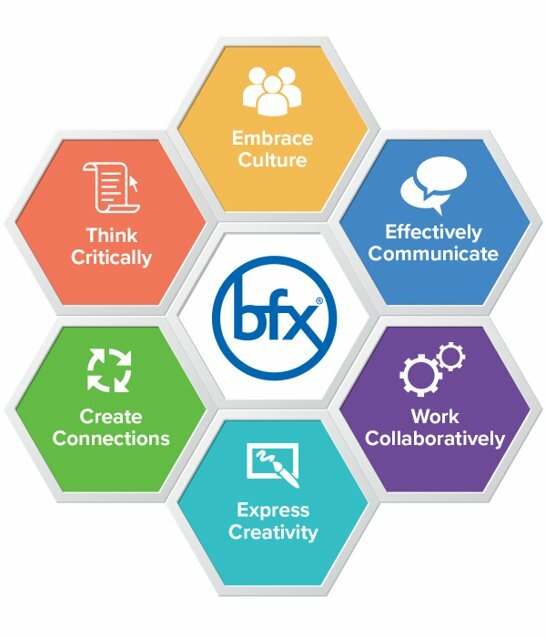 At BFX Furniture we recognise the different pedagogies of Future Focused Learning - there's Project-Based Learning, Problem-Based Learning, Inquiry Learning, STEM, STEAM, the Maker Movement and more. However, the core philosophy remains the same and it's a philosophy that revolves around the same question. What Are The Future Focused Learning Zones? At BFX we have designed a series of 'Future Focused Learning Zones' adapted from the '6 Cs' of 21st Century Learning. Our zones are classroom packages specifically designed to encourage and help facilitate the application of Future Focused Learning by transforming traditional classrooms into flexible and innovative learning environments. We specialise in creating exciting learning spaces with flexible, mobile, agile and height adjustable furniture that will allow your classroom to grow as the learner grows. Students don’t just thrive in amenity rich settings, they begin to congregate towards spaces they enjoy learning in. They discover their own learning style and become ‘Future Focused Learners’ when you give students the choice of not only how they learn, but where they learn in Future Focused Learning Spaces. BFX has grown to become one of the leading suppliers of furniture in Australia. With a service backed by years of extensive industry experience and a team dedicated to market research, we don’t just deliver furniture, we deliver innovation and superior design. Explore our range of Future Focused Learning Zones today and pave the way for excellence in academics and education in the 21st century. BFX holds the largest range of Independently tested products by AFRDI and our 7-Year warranty guarantees that you have the peace of mind and quality assurance you need. We'll help you fit-out your entire school with BFX Furniture and make it a Future Focused Learning environment where students thrive. An Expert Furniture Consultant is just a call away. We come to you! You can also visit any of our showroom locations including Brisbane, Gold Coast, Sydney, Adelaide, Melbourne, Sunshine Coast or Townsville. © BFX- Furniture 2019. All rights reserved.